Soon the mornings will no longer allow us to swim before work. We’re going to try for one last early morning swim, into daybreak. 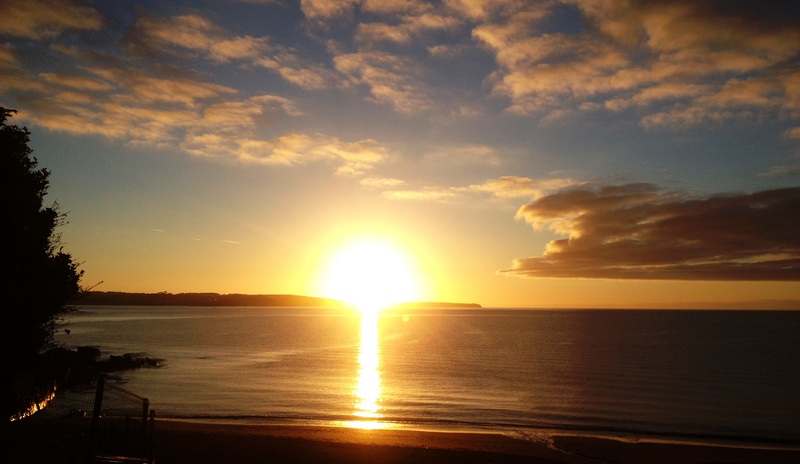 We’ll avoid saying a “sunrise” swim – it’s Ireland, it could be cloudy! So here is your one week warning to arrange whatever you need to do at home/school/work! Next Wednesday (18th Sept), we will meet at 06.20am to swim at 06.30am in Myrtleville. The route will be determined on the day – towards Fountainstown and back if calm enough, or a leisurely Triangle to the Rock and Bunny’s if a bit rougher. Either way, we should be able to enjoy the day breaking from behind Roches Point. This invitation is open to ALL OW swimmers, wherever they are from! Pass the word on, this will probably be our last big ‘group’ OW morning swim for a while…. Myrtleville at dawn – September 2, 2013. This entry was posted in Events and tagged Myrtleville swimming, Open water swimming - Cork, Open water swimming - Cork - Ireland, Sea swimming - Cork, Sea Swimming - Cork - Ireland by myrtlevilleswimmers. Bookmark the permalink.